Early Mars may have had rings like Saturn, and might have them again, according to a new model. The research suggests that debris, pushed into space from an asteroid or other body, slammed into the red planet around 4.3 billion years ago and alternates between becoming a planetary ring and clumping up to form a moon. A theory exists that Mars’ large North Polar Basin or Borealis Basin, which covers about 40 percent of the planet in its northern hemisphere, results from that impact, sending debris into space. “That large impact would have blasted enough material off the surface of Mars to form a ring,” says Andrew Hesselbrock, a doctoral student in physics and astronomy at Purdue University. The new model suggests that as the ring formed and the debris slowly moved away from the planet and spread out, it began to clump and eventually formed a moon. Over time, Mars’ gravitational pull would have pulled that moon toward the planet until it reached the Roche limit, the distance within which the planet’s tidal forces will break apart a celestial body that is held together only by gravity. Phobos, one of Mars’ moons, is getting closer to the planet. According to the model, Phobos will break apart upon reaching the Roche limit and become a set of rings in roughly 70 million years. Depending on where the Roche limit is, this cycle may have repeated between three and seven times over billions of years. Each time a moon broke apart and reformed from the resulting ring, its successor moon would be five times smaller than the last, and debris would have rained down on the planet, possibly explaining enigmatic sedimentary deposits found near Mars’ equator. 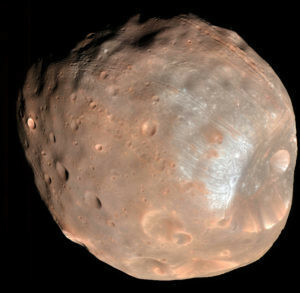 Other theories suggest that the impact with Mars that created the North Polar Basin led to the formation of Phobos 4.3 billion years ago, but Minton says it’s unlikely the moon could have lasted all that time. Also, Phobos would have had to form far from Mars and would have had to cross through the resonance of Deimos, the outer of Mars’ two moons. Resonance occurs when two moons exert gravitational influence on each other in a repeated periodic basis, as major moons of Jupiter do. By passing through its resonance, Phobos would have altered Deimos’ orbit. But Deimos’ orbit is within one degree of Mars’ equator, suggesting it has had no effect on Phobos. Richard Zurek of NASA’s Jet Propulsion Laboratory in Pasadena, California, is the project scientist for NASA’s Mars Reconnaissance Orbiter, whose gravity mapping provided support for the hypothesis that the northern lowlands come from a massive impact. “This research highlights even more ways that major impacts can affect a planetary body,” he says.